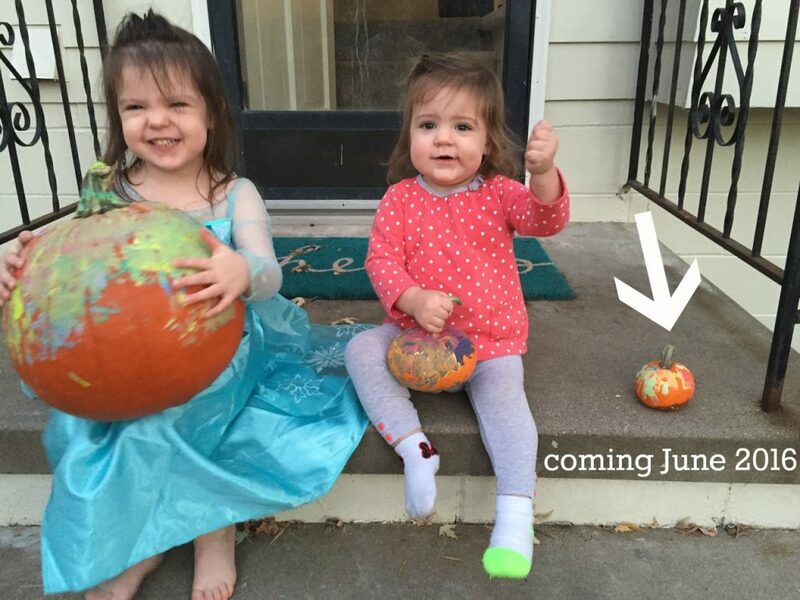 As you can see, Addie is pumped and Emma thinks she’s excited, but she has some hesitations. I’ve tried several times to eloquently write out all my thoughts about being pregnant after a miscarriage, and I just can’t get them out clearly and concisely. But I want to share some anyway. We were fortunate enough to have 2 healthy, relatively normal pregnancies and childbirths before having a miscarriage. We are now pregnant again, and it’s felt a little different. Of course, I hope and pray for this baby just like I did the others. I smile at the ultrasound photo on the fridge and love to answer all of Addie’s questions – she is so curious. But now, we also know firsthand, that getting pregnant is not a guarantee that we will meet this little baby this side of heaven. We had an early miscarriage when I was about 6 weeks pregnant. A month later, we stood beside another couple we love, at the burial of their little boy, who died in the womb sometime around 16 weeks. She labored, gave birth, and they held their baby who was smaller than her hand. So, this time, our 4th pregnancy, we’re a little more aware. We’ve encountered more pain and brokenness than we had 3 ½ years ago when I was pregnant with our first. We’ve also experienced deeper love and comfort from our God. We’ve seen time and again His faithfulness to us and people in our community. And we’re trusting in Him to protect and watch over this baby. I’ve never really blogged regularly about pregnancy stuff through a pregnancy, but maybe I will this time? Or maybe not. I have been napping or vegging on the couch through a lot of the girls’ afternoon naps, and then in bed by 8:30. And then sleeping until they wake up in the morning. Nothing extra has been happening around here lately, including blogging. Well, I’ve watched all of the current seasons of The Good Wife & Nashville (“Trashville” as Ben calls it). I guess that counts as extra. Cravings: Junk & carbs & takeout. Specifically, Jimmy Johns, Chinese food, & Olive Garden. I have craved Jimmy Johns and Olive Garden through all 3 pregnancies. Morning Sickness: worse than my other 2, but not as bad as it could be. Gender: We’re NOT going to find out at the 20 week ultrasound. We found out with the other two, but we want to mix it up this time just for fun! Living on the edge. Most disappointing: Almost immediately, I lose my taste for coffee. This has also been true through the first trimesters of all 3. If you know me well, or have read this blog for any amount of time, you know that me without coffee is a recipe for disaster. Withdrawl + toddlers + early pregnancy = crabby mom. Haha. Let’s just say I have to pray a lot more those first weeks off coffee … Also, my mom suggested I might take a caffeine-withdrawl pill. Me: Kind of like a nicotine patch? Me: I AM NOT AN ADDICT. I DO NOT HAVE A PROBLEM. This time around, 11 weeks in, coffee still doesn’t sound very good most days. In the morning, the smell of Ben’s coffee makes me want to puke. I’ve been drinking tea instead. I love the taste, maybe even more than coffee. But there is no awesome-perky-conquer-the-world buzz after a cup of tea. So, there you have it. A bunch of weird stuff you probably didn’t care to know about this pregnancy mixed in with some sentimental feelings about pregnancy after miscarriage. Congrats again! I love the Yogi brand tea called Perfect Energy. It is the only tea that does give me a little jolt and that I like the taste. Our stores don’t seem to carry it anymore so I actually order it on amazon now. Hope your taste for coffee returns soon as you enter your second tri!